A strategic plan is a document that establishes the direction of a company or work unit. It can be a single page or fill up a binder, depending on the size and complexity of the business and work. Most managers would benefit from having their own strategic plan. 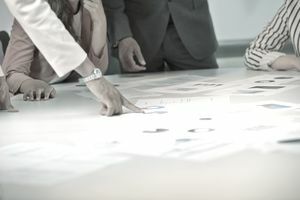 The process of developing a plan helps the manager (and the team) step back and examine where they are, where they want to go, and how to get there. In the absence of a plan, work still gets done on a day-to-day basis but often lacks a sense of purpose and priority. Here is a template for a basic, simplified strategic plan that any manager can fill out, providing both long-term purpose and direction and tactical operating plans. While a manager could certainly complete the template alone, I recommend a more collaborative approach. A vision statement is an aspirational statement of where you want your unit to be in the future. “Future” is usually defined as the next three to five years, but it could be more. A vision should set the overall direction for the unit and team and should be bold and inspirational. A vision describes the “what” and the “why” for everything you do. Here is an example vision statement from Zappos: “One day, 30 percent of all retail transactions in the US will be online. People will buy from the company with the best service and the best selection. While a vision describes where you want to be in the future, a mission statement describes what you do today. It often describes what you do, for who, and how. Focusing on your mission each day should enable you to reach your vision. A mission statement could broaden your choices, and/or narrow them. Note that the statement is both aspirational (“to be one of the…”) and descriptive of what they do and how they do it. Core values describe your beliefs and behaviors. They are the things that you believe in that will enable you to achieve your vision and mission. SWOT stands for strengths, weaknesses, opportunities, and threats. A SWOT analysis sums up where you are now and provides ideas on what you need to focus on. Long-term goals are three to five statements that drill down a level below the vision and describe how you plan to achieve your vision. Each long-term goal should have a few (three to five) one year objectives that advance your goals. Each objective should be as “SMART” as possible: Specific, Measurable, Achievable, Realistic, and Time-based. Each objective should have a plan that details how the objective will be achieved. The amount of detail depends on the complexity of the objective. The strategic plan starts at the highest level (vision) and then gets more specific, short-term, and specific. Both are important.